Now that we’re in August, most youth ministries are winding down from the summer and looking forward to the new school year launching. It felt like it was a long way off just a few weeks ago, but now the school year doesn’t seem that far away considering all the prep that needs to be done before then. Hopefully part of your prep includes youth leader training for the new school year. It’s always a good idea to kick off the year with leaders who have the right frame of mind, a correct view of youth ministry, and are ready to minister to students and teenagers. 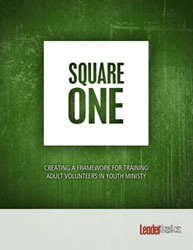 This free lesson from LeaderTreks’s Square One series, The Purpose of Youth Ministry, will help your adults have a correct view of youth ministry. Many adult volunteers think youth ministry is the ministry of the church to students when in reality youth ministry is the ministry of students to their world. To snag this download you’ll have to part with some personal information and sign up for their email list, but if you’re not already familiar with LeaderTreks, being on their mailing list is something you should probably do anyway. (They’re not giving me any perks to say that, either.) They do amazing things to help you turn the teenagers in your youth group into leaders.